Cycle Logic Engine Ice 64 oz. 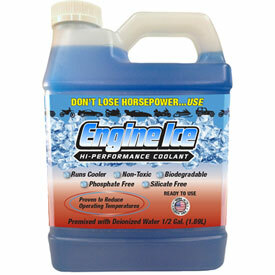 Engine Ice is a high performance motorcycle and ATV coolant and antifreeze. The coolant formula is pre-diluted and environmental friendly. Engine Ice coolant and antifreeze keeps engines running cooler while offering protection against freezing. This is a great choice for your performance motorcycle, dirt bike, or ATV. Engine Ice coolant has been proven to reduce operating temperatures by as much as 50ºF. Engine Ice coolant is non-toxic and biodegradable and comes pre-diluted so it is ready to go. Antifreeze that offers freeze protection up to -26 degrees Fahrenheit. needed coolant so thought i would try this. it works great. Great coolant.. use in both my CR 250R and my CFR250X.. Definitely recommend this product and it is a great price! Pricy but it’s worth it. Keeps my bike cool in the right sections. I use it on all my bikes. Great product! Will always buy engine ice for my bike, highly recommended product. Stuff is golden, keeps my my bike running cool even when I’m on some nasty local single track with lists of 1st gear sections and tip overs. Bike runs and preforms amazing without any over heating problems!!! Vary happy with this product! My bike was overheating due to installing an oversized gas tank, just switching my coolant to this engine ice made a noticeable difference. I used this for XC racing and would not recommend it. Saw fewer problems with regular 50/50 antifreeze. Also when you overheat with this is gells up. This is all I run in all of my vehicles. Lowers overall temps in this Vegas heat, great anti corrosion properties as well. Never a boil-over issue since I've been using this coolant. Also paired this coolant with the stock OEM KTM fan and a aftermarket programmable thermostat unit which comes on at my predetermined temperature setting. Never once had an issue,even though some of my riding buddies have boiled-over while on the same exact rides together. There IS a difference ! Was hesitant, but this stuff works ! Super Happy with this stuff. Haven't had a bike boil yet with engine ice. Great price at rmatvmc. Run this in all my bikes. Seems to help my 450 in the tight stuff. At least I could tell a difference over other coolants. Boil overs are less likely! I’ve been using engine ice for years in many of my bikes. Yz250f, Yz450f, KTM 250 XCF. It just works. Really I just like the name kinda catchy EngineIce! but yes it does perform very will. used to have trouble with coolant boiling in the really tight woods. Haven't had any trouble since I switched to engine ice. My 500 would overheat, started using this and it helped. However the real problem was the radiator being clogged on the inside so I have no real confirmation on the performance. Dropped the operating temperature 30 degrees F. easy to use. I have used this in dirt bikes and four wheelers for the last 10 years and now run it in my RZR. This keeps your engine much cooler than traditional anitfreeze. Good coolant, does what it’s supposed to, doesn’t leave deposits either which is a plus. The only coolant I run. I now have it everything. Buy it, use it, be happy. It's coolant. What's not to like? Pour it straight in and let 'er rip! Works well, especially with a 2.0 radiator cap. No more spews. Engine Ice is the way to go for sure! I love this stuff and it has been awesome at keeping my bikes cool. I will always purchase this for my coolant and I’m glad I know about it. I have never had an overheating problem since switching to this product. I change it once per year. You could feel the difference . I had 50/50 off the self mix in my bike and was riding with my brother who had engine ice in his 250 2 smoke and you could just tell the difference from just touching the radiator. I never had a boil over or check with a heat gun to know if it really ran cooler, but from just that I went out and got me some. Use it all the time love it. Kinda pricey but my bike runs like 10-20 degrees cooler than with Regular 50/50. yes you want this stuff. no it cant be mixed with regular coolant. save some old heavier plastic water bottles to put it in for on the trail, just in case. Will this work with a Can Am 800 Outlander 800? BEST ANSWER: I have successfully used Engine Ice in no less than 6 motorcycles (dirt and road bikes) and a Polaris 400 HO. The manufacturer specifies that you thoroughly flush your system and then run their product undiluted. It is by far the best I have used. There are other products that have a higher boiling point; however, if you think about it, you would rather know that your engine is running that hot, because if it is, you sure don't want to keep running it. Engine Ice is the best of both worlds. Should work on any veichle. High Quality coolant. Might be costly with a big 4x4, not sure of their coolant capacity. I run it in my race quad and seems to work better than prestone. Engine ice will work with any/every machine, but it is a MUST that you drain your previous coolant to run engine ice and don't mix it with conventional coolant! Hope this helps! And this stuff ROCKS! It definitely brought my engine temperature down enough to stop making it boil-over in the woods. As long as you use distilled water to remove all traces of old coolant I recommend this for anyone with a atv utv etc. Yes I use it in my street and dirt bikes it helped my Yamaha R1 run cooler after switching to it. This stuff is awesome. I have used it on 4 of my bikes with no issues at all. Yes. It's the best stuff on the market. Will this be enough for a 2004 Trx450r? BEST ANSWER: Yes this will be plenty for your quad, we have switched both my brothers over to engine ice and we had plenty left over with a bottle for each one. Run this in all of our race bikes and are very happy with its performance. Will the one thing if engine ice be enough for a Kx450f?? BEST ANSWER: Yes. It should be enough with a little left over. If it is not enough add some distilled water till the radiator is full. A little water will not hurt the performance of the engine ice. Does this product protect a against corrosion? BEST ANSWER: According to the manufacturer it does protect against corrosion and supposed to meet spec of ethylene glycol- regular antifreeze. Real-world I have not had any corrosion in my engine or in the fluid when I drain it when replacing it. Can this be mixed with Engine Ice? BEST ANSWER: This is directly from the Engine Ice Webpage. Answer: "We recommend you never mix ANY TYPE of coolant and antifreeze products. One reason is that propylene glycol and ethylene glycol do not mix well together. Another reason is that just because the base fluid may be similar, other additives and ingredients may not be. Just as you would not mix oils, and for the same reasons, you should not mix coolants and types of antifreeze." This isn't really an answer because I don't know for certain but I would look at the ingredients and unless I see something that clashes I would think you'd be fine. I think all of these things work off of the same basic principles and have the same basic makeup. Maybe a chemist will come in and give you a better answer. Can engine ice be ran in a 2015 polaris rzr 1000? Will this void the manufacturer warranty? BEST ANSWER: Before you do, do your research. Matt from the online videos WORKSHOP for engines did a series of tests that prove that this stuff is not good and why you should stick with 50/50. Yes you can run it in your razor and no it will not void your warranty.